From 2005 to 2016, the number of owner-occupied single-family homes dropped by 680,000, while the number of renter-occupied single-family homes increased by 6.2 million. The national median home value rose 7.4 percent year-over-year to $199,200 because of low inventory. The number of for-sale homes is down 9 percent — the greatest drop in inventory since August 2013 when inventory was down more than 10 percent. According to Zillow’s May 2017 Market Report, part of the reason for the drop in for-sale inventory is the growing number of single-family rentals since the housing market crash. From 2005 to 2016, the number of owner-occupied single-family homes dropped by 680,000, while the number of renter-occupied single-family homes increased by a whopping 6.2 million. Columbus, Ohio; San Jose, California; and Minneapolis experienced the greatest annual declines in inventory, with each city seeing about 30 percent fewer homes for sale. San Diego and Seattle followed behind with a 26 percent and 22 percent decline in for-sale inventory, respectively. One of the biggest effects of low inventory is booming home prices: The national median home value rose 7.4 percent year-over-year to $199,200. 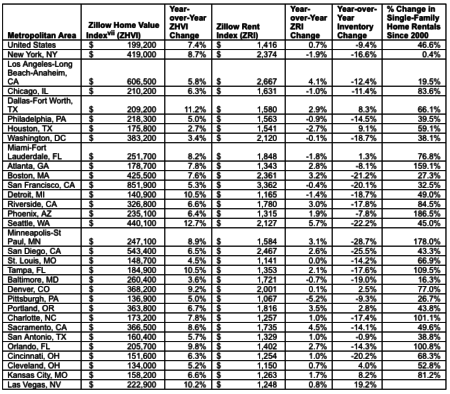 The markets of Seattle; Dallas and Tampa, Florida experienced the greatest gains with home values appreciating between 11 and 13 percent. Zillow Chief Economist Dr. Svenja Gudell says for-sale housing construction needs a major boost to help offset the impact of single-family renters on available inventory for buyers. “Inventory has been falling for years with supply no longer meeting demand, and there are multiple reasons for the worsening situation,” said Gudell in the report. “On the demand side, simple demographic change is contributing to incredibly high demand as millennials reach their prime homebuying years and begin to enter the market in droves. “This is coupled with relatively low levels of new home construction on the supply side insufficient to keep pace with demand, and what is built is largely priced beyond the reach of many of the first-time and entry-level homebuyers in the market,” she added. “Thousands of single-family homes that were once bought and sold every few years prior to the recession have now been converted into rental properties by investors, trading hands much less frequently and further contributing to inventory shortages.